Pitmen Painters proved not only to be an enjoyable play, but another opportunity to enjoy Watch this Space at the National Theatre. From previous experiences at Watch This Space, I had come to expect music, dance and acting from the performances I had seen. Last night though, it was a complete surprise what they had performing in the green area. This weekend’s performance is La Roué de la Mort: La Trilogie du Temps. As the website states, “For Thames Festival weekend, we have one of the most jaw-dropping spectacles we’ve ever seen. On a remarkable structure of a counterweighted cylindrical wheel which pivots around a 10m wide central axis, a trilogy of narratives weave a dramatic episodic spectacle through time.” It is a three part presentation on time and how it can affect humanity. How it’s presented is through amazing acrobatics and gymnastics. When we exited the theatre we found ourselves gaping at this large spinning wheel. We actually described as an overly large, unusually constructed hamster wheel. As to what it would be used for, we had no idea. 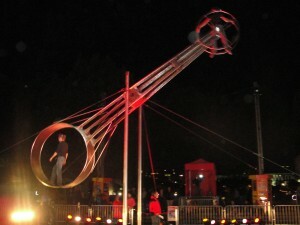 Then we understood as the performers came up to the wheel and began spinning it and doing crazy gymnastics on and through it. We were all amazed to the point of being incapable of speech. It wasn’t something we would expect from an area sponsored by the National Theatre. To me, it was another example of how the performing arts here receive more support from the state. And I find myself jealous of the opportunities that it provides for British citizens. They have the ability to find free performances of groups that we would have to pay dearly for back home. This is the one aspect of London and Britain as an entity that I have come to admire and even envy. Even though, I do not participate in the arts anymore, it is still something I love. There is nothing better than seeing a good play, concert, opera, et cetera. But back home, it costs money to enjoy this. Here, there are numerous opportunities for free concerts, plays, and other types of performing arts. Not only are they free, but they are guaranteed to happen. They aren’t scheduled and then canceled due to a lack of interest. There is an interest here for them. That is something that I envy. It also speaks wonderfully of how the British view and support the arts. They don’t limit performances to only music or drama, but include other forms such as the one being featured this weekend or the one for next weekend, which is called “Spin Cycle” and includes the washing of dirty linen and bicycle dances. I can honestly say that Watch This Space and London’s appreciation of the performing arts is the one aspect I will miss the most when we leave for Norwich.